Our new software called IPTV Checker, from its name you cam guess what is about. with this software you can check any IPTV list (m3u8, m3u, or txt) and the application will check each link inside the list if it is online or offline without your intervention, it is multi-threaded so it can check the links in fast manner. Hi, just been using your program Free IPTV Checker, and i am glad you made it. Very nice work! Just found a fault in some iptv list, where more then one hhtp link is used for a channel. Your program expects the first link to be the stream info, and does not check if there is another http: adres further along the line. WIth as a result that you get the message that a channel is OFFLINE. Hope you understand the problem, and i hope you can fix this in a future update?! That would be nice! For files that have h**p link for stream information simply load list in a VLC than save it via “save playlist to file” command. VLC will save the playlist with only a channel name and a true stream link. 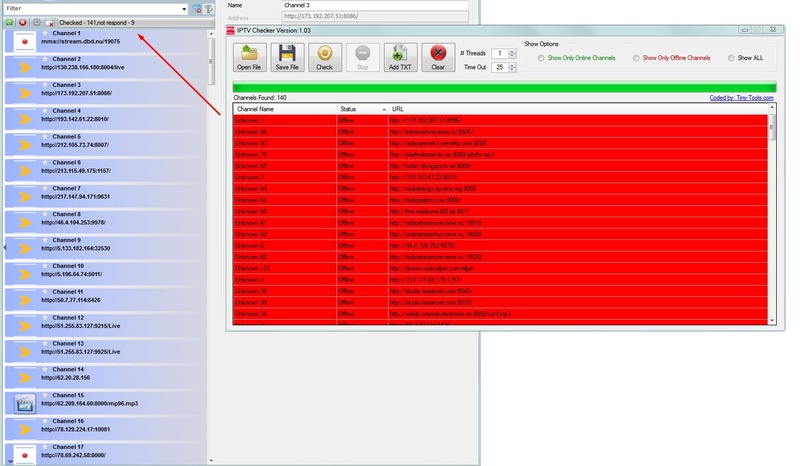 Than load list in iptv checker. Could you make the GUI window re-sizable this way we could see more links at the same time and we would have to scroll lot less to see all the links. can you support for this kind of links on next update? You should use the default handler for m3U files instead this way the program registered to use M3U will be used. Another way could also be to have a menu to tell where our VLC is on our system. Do you have a beta version that I could try that would fix it ? Best Regards and thanks for your Amazing program ! ??? You are right, The application will only detect the path of VLC it it is only located on the C drive, I will add a feature to manually select the path of VLC. Thank you for this i don’t have any problem’s with this software but it is very good well done fellow. Sir, I appreciate your work keep on to make it better . – Is it a way to check all kind of streams not only IPTV ? Sorry for the late reply because i don’t have a lot of free time as i’m working and having a family, our application are mainly designed to check IPTV Streams not any link.. I’m working on a new version and i will include the rtmp support in it and an option to choose the right path of the vlc executable. just stay tuned, when we make an update our program will notify you about that. Thanks for the hint, I will include that in the next version for sure. I really don’t have a time-frame, as I don’t have a lot of free time. but believe me it will be finished sooner or later, and when a new release is available, you will be notified when you use our application. I will like to first say thanks for this software and to ask for a duplicate eraser to be able to mix lists. The current version supports that. i have downloaded version 1.04 but my antivirus finds trojan every time i clean and restart same again? this is from your official link now i can use the old one as that link now downloads the new one please advise what has happened as this was a decent software. Hello, it is normal that some antivirus softwares see it as Trojan as our application tries to make many web-requests at the same time to check the streams links. I installed version 1.04 and can not open it, asks me to upgrade to a new version. How do I get back to version 1.03? With me comes the same message as with prigi321. Unfortunately, you can always download only the 1.04 version. Unfortunately you can only use the latest version. Is the last version only online? Will update it and fix that problem. and will add the ability to use an older version. I would like to develop the software. In what language was the software written? Do you give out the source code? Is it maybe open source? Dear Admin. Thank you for new version. Issue 1. new version every time asks me to upgrade to a new version. I deleted old version but Nothing has changed. Issue 2. Win10 x64 pros installed – VLCx64 3.0 version. reveals an error that VLC is not installed ..
in the settings i put file path vlc and save. the next time it generates the same error VLC is not installed. when you close the application and reopen it again does the application remember the path of vlc? Sir, it is a false positive as the application makes many http requests when checking the links, the antivirus thinks it is a virus. if you are not yet convinced, ignore my reply and don’t download it. You are the best Thanks a lot ! Hi. When I try to download is blocked by AV. Can you check if this is infected with some virus? No it is not infected this is a false positive, because the application aggressively checks for multiple URLS. I’ve check iptv links from freesourcetv and works. The software check the links and save only the links who works. Thanks! Sorry to tell you that i can’t embed that feature in the app as it exceeds the apps scope. Question, are you guys able to add some option like (get links alphabetically) after you paste links into (import links from text) ? Yes we can, we will add this option in the next release, Stay tuned! Is it possible to add option (save list as .txt file) ? Great program. Checked the Fluxus list and 50% were dead. Thank you. Could you elaborate more, our application can check any IPTV url and check if it is alive or not! But It dont save when I edit stream name? I seen IPTV Hero Software but There is not in your website. What is winrar password that software? The application will have a minor update in the next months as i have a lot of work, and regarding the IPTV hero, it is not officially online. but will be soon. is it posible to add multiple proxys for testing the streams and a window below big one to show open \ working links as it finds them . Testing IPTV channels using proxies is bad idea as it lags a lot and the application will consider it as offline! adding testing screen below the application will need a lot of work as if VLC is not correctly installed on the machine the application will not run. Thanks for your software, is awesome. is there a way to select some offline channel and put online? because my playlist have also categories, and when i scan the software see that are offline, i need to save the categories. and there is a function to select and delete duplicate link=? regarding the first question, sorry to tell you that the answer is no. for the second question the application already remove channels with duplicate url. First off, thank you for providing such an amazing software for free and devoting your personal time for everyone’s benefit. I want to be able to customize channels in groups and that’s why I’m reaching out to you to see if this might be in the works. See some iptv provider’s m3u have over 4000 channels, for all audiences. Since I’m only interested in English ones, I want to customize my playlist in such a way that I assign my own group tag to the ones I watch and either delete or, throw all the other junk channels into the junk folder (group), that way they are out of the view. So to do that if there was an ability to move channels into custom groups that would be excellent. The provider does have grouping, but their grouping and nomenclatures seems to be done by 4th graders. Next would be the channel logo column – now I know I’m getting greedy here, but just an idea. It would be great if the client application had the ability to scan “known sources” and return with a nearest match using the channel name/group info and downloaded the jpg thumbnail to show in the UI. Then when compiling the (new) m3u8, it appends the url in the right string. So in theory, these procedures would be applied after URL validation and the result will be a washed, working, customized playlist, ready to rock n roll. Finally, if there can be a direct upload to say, a google drive, to be dynamically pulled by the player’s client, then users can add a tiny url to their TV players/Kodi etc, and scrub their lists ever so often. I know this sounds like a lot of work, just thought it might give you some ideas for future roadmap. Hello, and sorry for being so late. Thanks a lot for your comment I like when i receive constructive comments like yours. But to be honest with you, in the mean time, i really don’t have time to upgrade the software these days because of work and study but when i do that i will inform you for sure, and i will implement some features you have mentioned specially grouping channels. Thanks very much – generally very useful. However, do you know why it sometimes shows a link, which will not play with VLC, as being Online. some channels have lags that’s why. Windows 10 defender quarantines and deletes on download. I have merge some iptv files with vlc and would be nice to have an option that deletes duplicate entries based in the url. I have see many files that have the same entries, in that way i can have a large files with unique links. have some way to extract the real links from the paid list, they put links with the user and password, but it is temporary, how can I find the permanent link? Is there such a tool?